Add on product for TurfMend Sun and Shade. The Ballard Turf Repair Bottle easily dispenses fill mix for quick seed recovery. 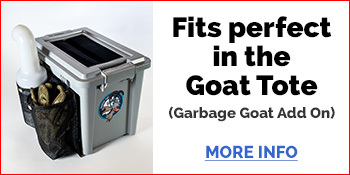 Measuring 3 1/2″ dia and 13″ tall, the bottle assembly can be conveniently mounted on equipment, in your Goat Tote (Garbage Goat) and easily accessible.